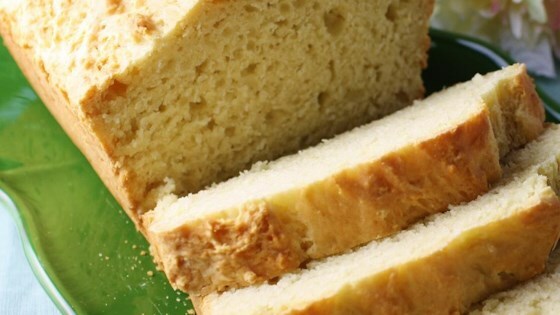 "A very easy, very good tasting bread. Best if made the day before, or several hours before serving." From the photo of this bread, it does look irresistible. However, there is one ingredient that is not listed and probably makes this bread irresistible, and that is Raisins. Wonderfully soft and moist. Everyone at our St. Patty's Day party loved it. I put the batter in two aluminum loaf pans (the kind you can throw away) and they baked up beautifully. Thanks! Very Good. This bread is a soft dough, so you must put it into a bread pan, unlike other soda breads that you can shape into a loaf. This as with all soda breads is a dense bread. Quick and easy! I added some raisins and sour cream. Totally enjoyed it!